Apologies for not posting for so long. Yes, an actual human writes and posts this information. Here’s an item that should have went up two weeks ago — another run by Anticon co-founder Sole & the Skyrider Band. They’ll be accompanied by Fake Four Inc. owner Ceschi Ramos and Oldominion side project Dark Time Sunshine. 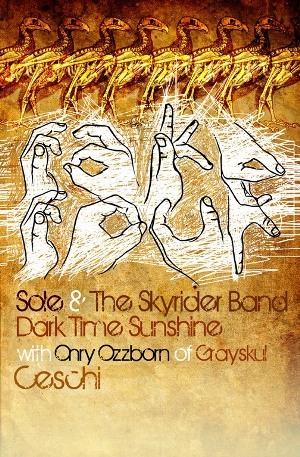 This entry was posted in News and tagged Sole, Sole & the Skyrider Band. Bookmark the permalink.